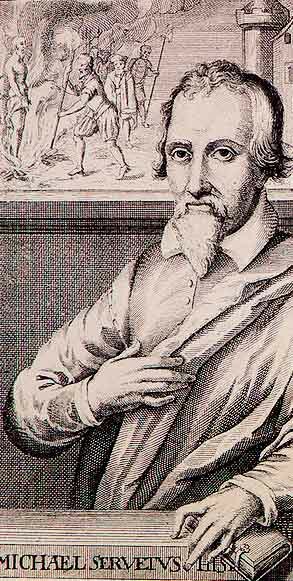 Today (September 29) is the birthday of Miguel Servet, better known as Michael Servetus (1511-1553), the Spanish theologian who forcefully denied the Trinity, and died for those convictions. Discussions of the execution of Servetus are easy enough to find, usually in connection with John Calvin’s involvement in the process. But on his birthday, let us look at him not as a footnote to Calvin, but on his own terms. What did this man teach that caused him to be hounded from country to country, pursued by the Catholic Inquisition and finally executed by Protestants? Much of this is sophistry and special pleading, but to Servetus’ credit, the bulk of his work is taken up with verse-by-verse biblical argumentation, in which he reinterprets traditional Trinity texts in anti-Trinitarian ways. In fact, the most interesting thing to be gained from a reading of Servetus himself is the education it provides in Trinitarian exegesis. In several places of Scripture, Servetus does in fact score palpable hits against overblown interpretations, the kind of things that find the Trinity lurking in verses where it simply isn’t taught. That kind of critical inquiry is always bracing and ultimately helpful for the state of theological knowledge. But he also has to do some very nimble hermeneutical acrobatics to twist his way around the deity and preexistence of Christ in numerous passages. He has to construct massive interpretive schemas to shift the burden of proof, schemas which become at least as difficult as the Trinitarian categories themselves. It’s in this hand-to-hand grappling with Scripture, though, that Servetus rightly wanted the battle to be lost or won. It is clear, therefore, that we are Tritheists, and we have a threefold God: we have become Atheists, that is, men without any God. For as soon as we try to think about God,we are turned aside to three phantoms, so that no kind of unity remains in our conception. But what else is being without God but being unable to think about God, when there is always presented to our understanding a haunting kind of confusion of three beings, by which we are forever deluded into supposing that we are thinking about God. I set forth my theme in another way, and prove not only that the three beings can not exist in one God, but that they can not even be imagined, and that it is wholly impossible to have any notion of them. For one having a notion of the Trinity would have distinct notions of the three beings; and this would amount to having a notion of one by not having a notion of another, which all deny. Dream as much as ever you will, fix your eyes on the mental images, and you will find that the Trinity is not to be understood without three such images; because it is necessary for one who thinks to observe these images. Indeed, you cherish a Quaternity in your mind, though you deny it in words. For you have four ideas, and the fourth is a mental image with respect to an Essence, because it is necessary in understanding the Essence to observe the mental images; and when you have seen these, you will comprehend clearly what I shall say elsewhere as to the formation of the notion. And even now, if you give heed, you can realize that your Trinity is nothing else than a kind of moving of forms in your imagination, which holds you deluded. The “quaternity” charge is an unworthy argument easily dispatched with some elementary philosophical distinctions, but the force of Servetus’ argument lies in its appeal to the imagination. If Servetus is right, then the doctrine can only exist in a human mind as a kind of juggling of merely verbal propositions. No sooner do I conceive of the One than I am illumined by the Splendour of the Three; no sooner do I distinguish Them than I am carried back to the One. When I think of any One of the Three I think of Him as the Whole, and my eyes are filled, and the greater part of what I am thinking of escapes me. I cannot grasp the greatness of the Rest. When I contemplate the Three together, I see but one torch, and cannot divide or measure out the Unidivided Light. The difference between Servetus’ confusion and Gregory’s adoration is not just in the tone of voice. They have made completely divergent decisions about the fact that the doctrine of the Trinity is mind-blowing.